This interesting name is of Anglo-Saxon origin, and is a locational surname deriving from any one of the places called "Harthill" in Cheshire, Derbyshire and West Yorkshire. The place in Cheshire is recorded as "Harthil" in 1259, the place in Derbyshire as "Hortil" in the Domesday Book of 1086, and the place in Yorkshire as "Hertil", also in the Domesday Book. All the placenames share the same meaning and derivation, which is "the hill frequented by harts, stags", derived from the Old English pre 7th Century "heorot", hart, stag, with "hyll", hill. The development of the surname includes Robert de Herthul (1273, Derbyshire), Edmund de Herthille (1379, Yorkshire), and Francis Hartill (1603, London). 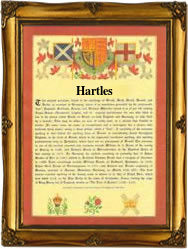 The modern surname an be found as Hartell, Hartill, Hartle and Hartles, the latter being a "genitive" form, indication "of Hartle". The christening of John Hartles was recorded at St. Michael's, Macclesfield, Cheshire, on July 14th 1642. The first recorded spelling of the family name is shown to be that of Robert de Herthil, which was dated 1176, The Pipe Rolls of Derbyshire, during the reign of King Henry 11, "The Builder of Churches", 1154 - 1189. Surnames became necessary when governments introduced personal taxation. In England this was known as Poll Tax. Throughout the centuries, surnames in every country have continued to "develop" often leading to astonishing variants of the original spelling.